Out in the yard this morning, I was watering plants and feeding the birds when I noticed a nest of spider eggs in my blackberry patch. My first thought was to get the diatomaceous earth so I could get rid of the nest. It’s right by where I walk, right where the dogs cut through the bushes to come into the house. The likelihood was very high that someone, probably Bailey or Bandit, would brush up against the nest and dozens of spiders would get a free ride into the house on dog fur. Diatomaceous earth – or D-earth, for short – is a naturally occurring material that consists of fossilized remains of diatoms. Essentially, silica from dead marine sediments. It kills insects by drying them up. It’s safe, natural, and my go-to product to kill insects. But just as quickly as I’d decided to get rid of the spider nest, the reality hit me that these were living creatures, and living in nature. The spider hadn’t built the nest in my kitchen or in my car (which happened last summer). My general rule of thumb is that if bugs are inside the house (or my car), they should be prepared to meet their maker. But outside, I generally leave them alone. Who am I to kill the spiders in their own home, just because they give me the willies? That’s when I saw the nest was moving. The spiders were hatching, right in front of my eyes. Life coming forth into the world. Good grief, so many spiders! And crawling in every direction! And so fast! I could feel my skin start to crawl. Spiders with the right to live, but also the potential to make my life decidedly difficult. As in, webs all over the yard, dogs crawling with insects, spiders in my hair. So do I dust with the insecticide or not? My point is that I kill stuff all the time and never feel bad about it. Why did I even hesitate this morning? I wonder if it’s simply the fact that more and more I’ve begun to feel like a part of a bigger picture, less “man controls the world” and more “man is one particle of the intertwined universe”. What if this nest was like Horton’s dust ball, filled with an entire world I can’t see or hear? 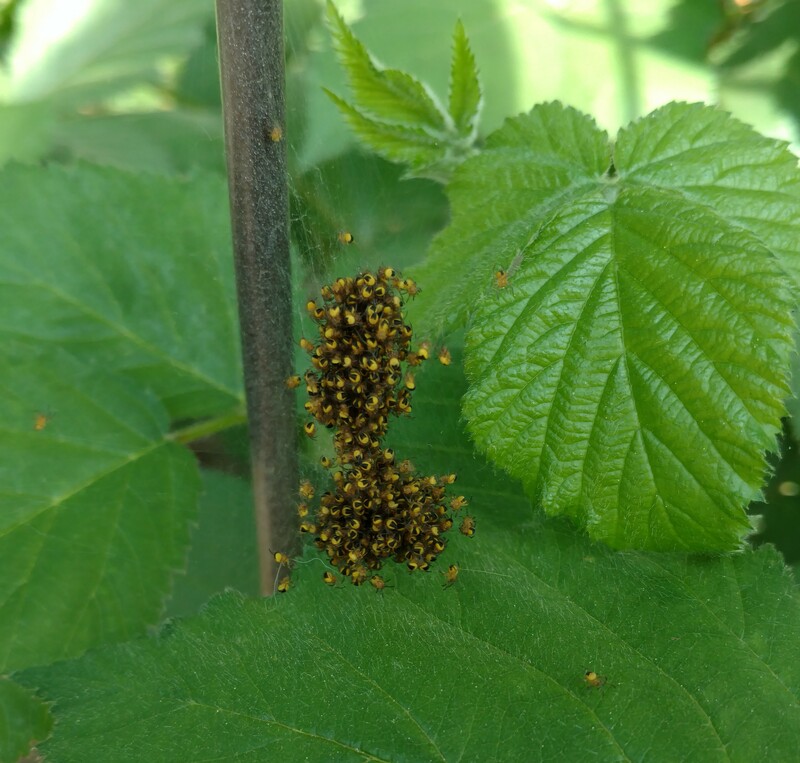 I stood there with the D-earth and pondered the spider nest, baby arachnids hatching and scurrying to the four corners of the blackberry patch. I’ll leave my decision about what I actually did a mystery. But tell me: what would you have done? So there’s been quite a bit of news here at the Funny Farm the last few weeks. I’ve been on the hunt for a new car, since the Jeep dogmobile was in need of repairs and it was looking like it might be a case of throwing good money after bad. 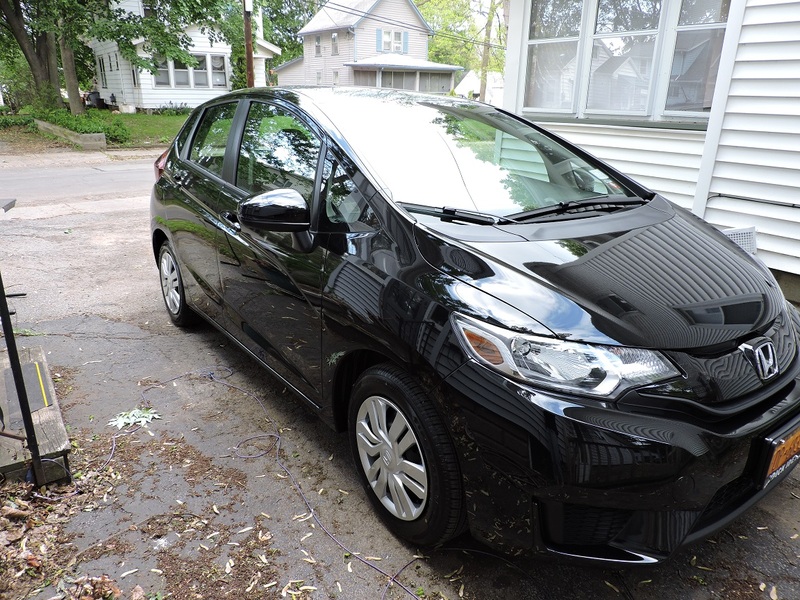 To make a long story short, after much shopping around, crunching numbers and test driving cars, we traded in the dogmobile for a 2015 Honda Fit. There was much weeping as I handed over the keys to the Jeep. Saying goodbye was also a little like saying goodbye to a period of five years in my life I’d just rather not revisit. But there are some good things; there was probably a lot of Scout’s dog hair in there. But I just kept reminding myself that I was trading 13 mpg for 35 mpg, and gaining the ability to get on the road and take a trip without having to rent a car. 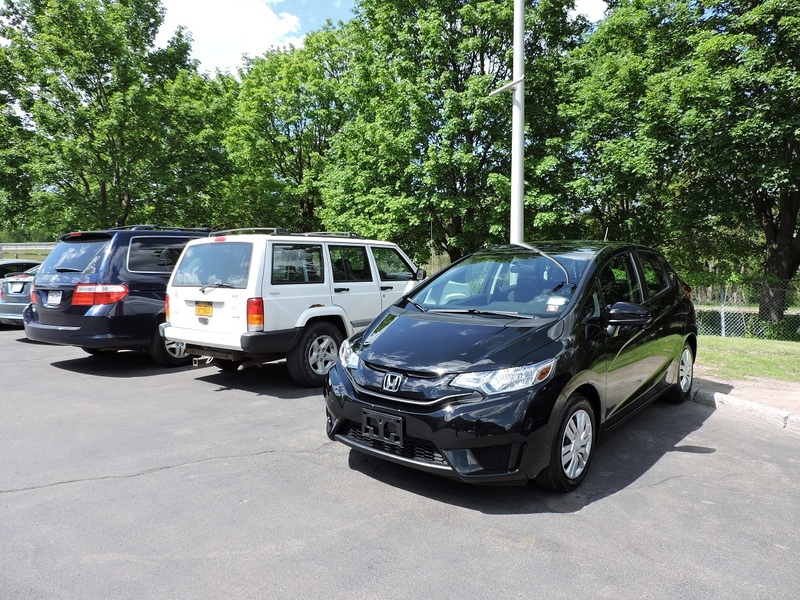 I opted for the Fit because 1) it’s a Honda and it’ll last me 200,000 miles; 2) the price and terms fit our monthly budget, including the savings I’ll get in gas and insurance; and 3) it’s super fun to drive. I like it. Darling husband likes it. And the dogs, who have only had a short ride in it, seem to like it. Bailey can bark out the back window more easily. Bandit seems to like his new ride in the front seat. What I didn’t plan on was what would happen when I had to haul stuff around. Today was the first challenge. I stopped into Wegmans and saw these amazing peony plants, along with blueberry bushes for just $5 each.We planted two blueberry bushes last year, very small plants, but with the winter cold, and probably mostly because Bandit peed on them, they didn’t make it. These blueberry plants at Wegmans were big and lovely, and would surely survive even my inability to grow anything. Since you need to have at least two varieties of blueberries to get fruit, and since they were only $5, I grabbed three varieties and one peony, just for fun. 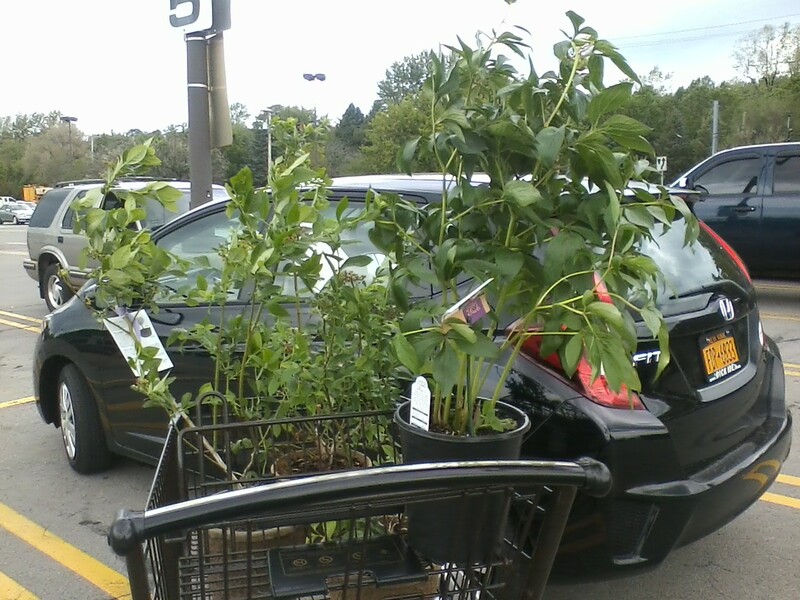 Feeling quite pleased with myself, I headed to the car only to realize … crap, I don’t know how I’m going to get these plants into that tiny car.